damages to the remaining trees on the site. The aim of forest management is multifunctional: to safeguard the production of high-quality roundwood, the biological diversity of forests and the potential for the multiple functions and services derived from forests. Because forest owners have widely differing needs and expectations, the range of forestry options has been broadened in recent years, and further development is ongoing. 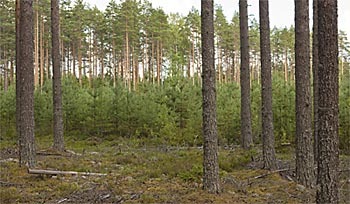 The basic unit for forest management in Finland is the stand. Forest stands are classified according to their naturally occurring plant communities, based on a forest site type classification developed by botanist A.K. Cajander in the early 20th century. The surface vegetation at each individual site indicates the properties of the site and also the growth potential of trees. There are six main site types in southern Finland, and management and harvesting are directed according to their properties. The average size of managed stands in southern Finland is about 1.2 hectares, which is about the same as the average in Germany, Austria and France. The big picture in landscape terms is fragmented and mosaiclike due to differences between individual stands in tree species composition, age structure and the timings of regeneration and management procedures. The principal silvicultural requirement is that forest regeneration after felling must be ensured. This is often difficult to achieve without soil preparation because natural forest fires are prevented; the special characteristics of the tree species, other flora and climate of the boreal zone lead to the formation of a layer of humus over mineral soil, inhibiting germination. Stand-based forest management in Finland’s boreal zone typically involves managing even-aged stands. Management is clearly divided into two phases, growth and regeneration. Depending on the tree species, geographical location and site characteristics, the recommended growth period varies from 50 to 120 years. At special sites, such as landscape areas and forest parks, cultural sites or forests dedicated for recreational use, uneven-aged management systems are also used. In uneven-aged management, different growth stages are concurrent, and stands are managed with single-tree selection. In the growth phase, seedling stands are managed by cleaning and thinning. Young and advanced thinning stands are managed by intermediate fellings, which are carried out 1–3 times during the growth cycle of the stand. Each time, 25% to 30% of the then current growing stock in the stand is removed. The purpose of intermediate fellings is to direct the growth of the stand in favour of the best trees, to encourage their growth and thereby to produce harvesting income already prior to regeneration felling. In the regeneration phase involving natural regeneration, seed or shelterwood trees are left standing to seed the site. Sometimes natural seeding may take place by trees on the forest edge surrounding the regeneration area, or several small regeneration clearings may be opened up by local felling in the stand. Artificial regeneration by seeding or planting is preceded by final felling that completely removes the growing stock. The success of regeneration is ensured by clearing the site and exposing mineral soil with mechanical soil preparation prior to regeneration, and ensuring that grasses will not endanger the early development of seedlings. The goal is to create a fully productive stand with a suitable species composition in a reasonable period of time. The majority of Finland’s current forests have regenerated naturally; about 35% are planted or artificially seeded. However, even artificially regenerated stands have great numbers of naturally regenerated trees as well. Natural regeneration of pine is most suitable in sites where the humus layer over mineral soils and surface vegetation does not prevent germination and later development of saplings. Biological diversity is promoted in fellings and other silvicultural measures by leaving dead, decayed and living retention trees in the forest and by managing valuable habitats in a way to preserve their natural characteristics. A mosaic-like variation in forest types at the landscape levels promotes biological diversity by creating habitats of different ages and at different stages of development. 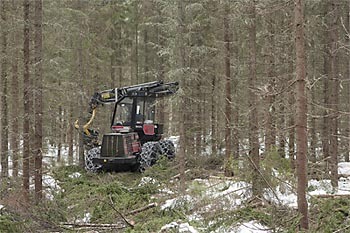 Trees are for the most part harvested using the Nordic cut-tolength system (CTL): logs are debranched and cut to appropriate length on site, according to their use. Branches and crowns are left in the forest to maintain an even nutrient cycle. There is a new trend to harvest branches and crowns in spruce stand fellings and in thinnings of young pine stands and of broadleaved stands to be used as fuel. The CTL system of cutting is particularly suited to conditions in Finland, as the land is fairly level. Fellings are carried out all year round to ensure a steady flow of wood, but mostly in winter, when the ground is frozen and covered by snow to minimise any detrimental effects of felling on the soil and the trees left standing.